Smoke billows near Tripoli international airport as militias continued to battle for control on July 20, 2014. Clashes were concentrated around the airport, the airport road and a number of residential areas where militias have fought over the past week, residents said. At least five people have been killed, one local official said. The airport has been under the control of militia from the Western Mountains city of Zintan for the past three years. 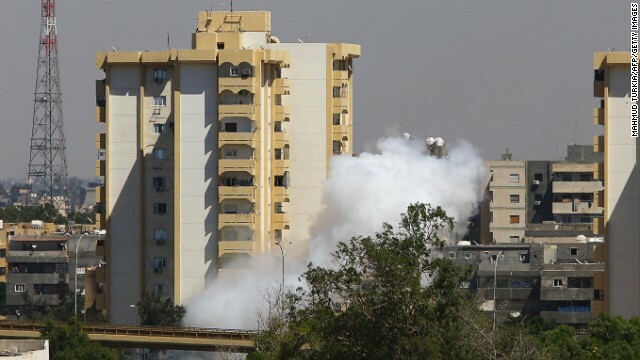 According to residents in different parts of Tripoli, thick plumes of black smoke rose from the direction of the airport and large blasts and gunfire echoed across the city. Speaking by phone to Libyan television on Sunday, a spokesman for the municipal council of Qasr Bin Ghasheer, the area around the airport, said at least five people from the area had been killed in the fighting so far. The spokesman, Mohammed Abdul Rahman, said it was hard to get an accurate casualty figure because of the intensity of fighting and limited movement in the area. “Shells are falling on houses, children are terrified and most people have evacuated. … Our area is suffering,” he told the privately run al-Nabaa TV. There was no official overall casualty figure for the fighting in other areas impacted over the last seven days. At the airport, the Libyan government said 90% of planes parked there were damaged and images on social media showed various parts of the facility destroyed. The United Nations and other international organizations and businesses have temporarily evacuated staff from Libya. The U.S. Embassy in Tripoli said in a statement that some rounds from the fighting have hit near the compound, but all personnel “are safe and accounted for.” It called for an end to the violence. Addressing the U.N. Security Council on Thursday, Tarek Mitri, head of its mission in Libya, issued a stark warning. “As the number of military actors mobilizing and consolidating their presence within the capital continues to grow, there is a mounting sense of a probable imminent and significant escalation in the conflict. The stakes are high for all sides,” Mitri said. “We are in the middle of an all-out confrontation between two major rival groups in the Libyan capital. That confrontation, born out of the deep political polarization, is playing itself out at the country’s international airport.” Mitri said. He insisted that his country was not requesting foreign military intervention. The Libyan Interim Government said earlier in the week it was discussing the possibility of requesting international forces. Three years after the revolution and NATO military intervention that overthrew the Gadhafi regime, a weak central government has been outgunned by increasingly powerful militias. The militia fighting for control of the airport from the city of Zintan and Misrata are among the most heavily armed in the country. Posted on 21st July 2014 by newsafrica. This entry was posted in Africa, African Union, al Qaeda, Democracy, Human Rights Violations, Islam, Libya, Religion, Terrorism and tagged Libya, Misrata, Politics of Libya, Sunday, Tarek Mitri, Tripoli, Tripoli International Airport, United Nations. Bookmark the permalink.